If you are looking to have an interesting dinner conversation, you should come to my parents' house for a meal, especially if my grandparents there. Our dinner time talks range from the season finale of Keeping up with the Kardashians and the 1980s Jaguar my Dad bought for $200, to how you can identify a quality toilet (and this was just during one dinner this past weekend) - for the record, my parents and the Kardashians have quality toilets in their houses. In addition to the entertaining conversation, the food is pretty amazing too. My mom puts together meals consisting of something for everyone. They end up being almost as random as our conversations (I'm talking kugel, meatballs, brisket, apple sauce and garlic bread all at one table), but I think they are perfect. Also, who doesn't enjoy a meal that they didn't have to prepare and is made with love by mom? Most nights, however, Jesse and/or I are required to make our own meals. We try to change it up and make new recipes so we don't get bored. 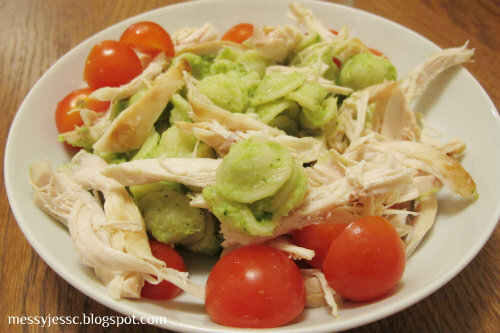 We also try to make recipes that don't require a lot of time or planning. The perfect recipe? 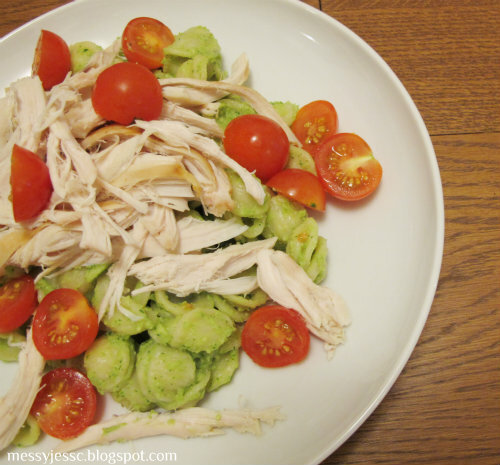 Avocado Pasta with Chicken and Tomatoes. As a runner, at least two nights a week I am eating pasta. 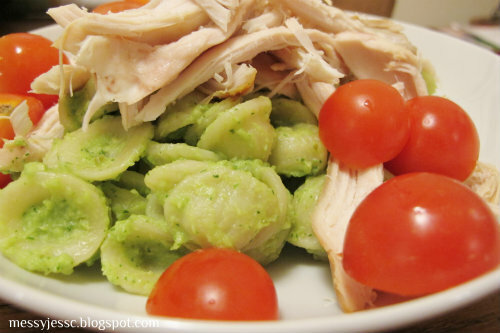 Thankfully, pasta is quite an amazing food because it serves as the base for all kinds of recipes and flavors, so it never has to get boring. This recipe is especially fun because it's different than your average Italian, Mediterranean, or American pasta dishes. 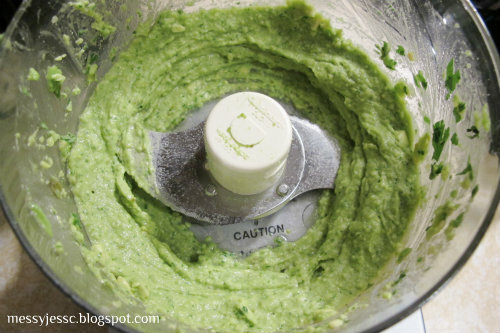 The avocado mixture in this recipe makes a tasty, creamy, and filling, but healthy sauce. 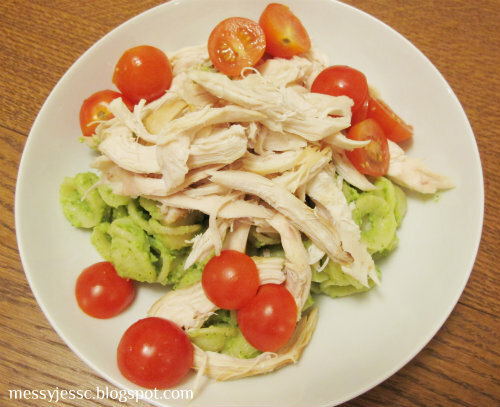 The tomatoes add a burst of flavor, and I am a huge fan of Roast Chicken, which also adds protein and flavor to the mix. The only downside? This dish doesn't make for good leftovers, so you will just have to eat it all at once. Once you have all of your ingredients, cook your pasta al dente according to the directions on the box. 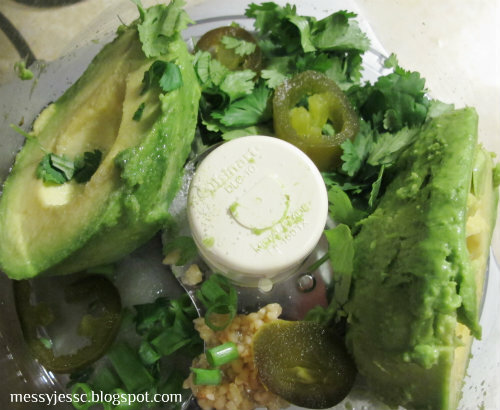 Next, place your avocado, lime juice, garlic, salt, cilantro, green onion, and jalapeno in a food processor and pulse until smooth (you may have to scrape down the sides a few times). 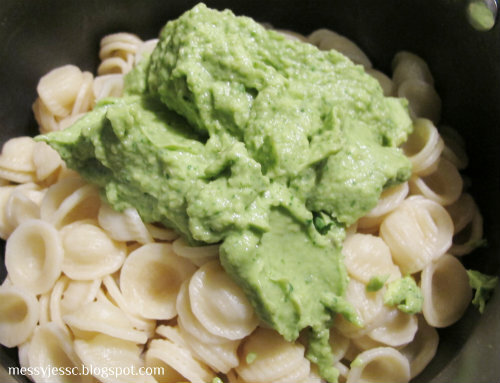 Toss the avocado mixture with the hot pasta and add some black pepper to taste. 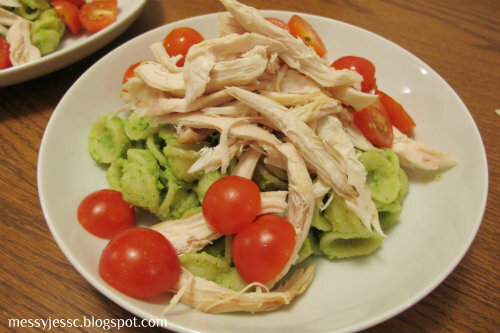 Divide the pasta between two plates and top with your chicken and tomatoes. Check out this and other tasty recipes on my What's Cookin' page.